I have been using Snagit for a long time for screenshots and screen capturing. 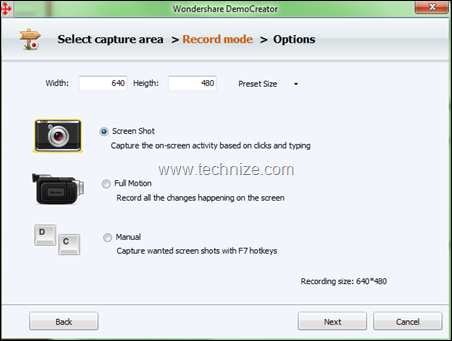 A few days back, Sameshow team contacted me for a review of their software, Wondershare screen recorder Democreator. I decided to give it a try and was amazed by it’s capabilities. It’s far advanced than any other screen recording solution I have used. It gives me three options for screen recording, one, I can capture the screen actions of one window which is very good for application recording. Two, I can set a custom screen size and record the screen actions of the selected area. Thirdly I can record the whole screen. It also gives me the option to either capture a screenshot based on clicks and typing or full fledge recording without any pausing or I can also use F7 key to take the screenshots I want. If I want to record the audio narration during recording, I can select it on the next screen. Stopping a video is very easy. Just press F10 and the video will stop recording. Then it will show the post recording options where I can preview, edit and produce the video. Editing a video is really a fun work. I get a Microsoft Office 2007 like interface with the Ribbon toolbar. The best thing I love about Wondershare DemoCreator is the publishing feature. 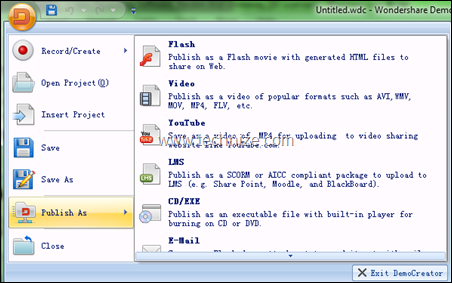 I can publish my videos in flash format or any other popular format such as AVI, WMV, MOV, MP4 and FLV. I can also publish my video optimized for YouTube or otherwise I can also make a standalone executable which can play my video without any media player. I would highly recommend this tool to all the professionals who do screen casting and screen recording regularly. 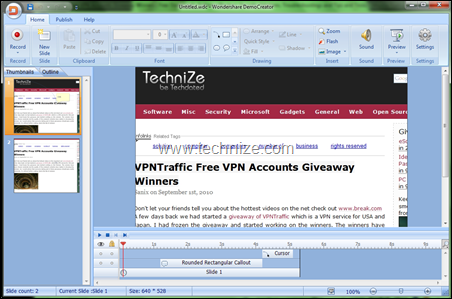 Lastly I would like to announce the giveaway of Wondershare DemoCreator software to 10 lucky users of Technize.com. All the users are welcome to take part in this giveaway contest. All you have to do is comment on this article and give your views about technize.com and Wondershare DemoCreator. The ten best commentors will be selected from the comments. Please note that this is a two step giveaway. In the first step, winners will be chosen from the comments and then announced in another article on 14th september 2010. The winners must comment on the winners page to get their licenses. To follow and participate in further giveaway contests, you can subscribe to technize.com via email or RSS. To suggest or request a giveaway software, go to our giveaways forum. Also see this post for future giveaways that we have planned. You may be interested in a free video converter tool. The possibility to record what goes inside a customized screen-area is by all standards a fantastic feature. I have not tried this program yet, but I sure will. I trialing DemoCreator and I must say I really easy to use and will help me in making presentation and proposal for our clients. Great giveaway. As rizal stated I too had used wondershare timefreeze and Flash gallery Factory, though I find timefreeze to be a bit low par when compared to DeepFreeze and similar products Flash gallery maker was superb… Ideal for ma work… This one here is surely a hot pick, as am looking for a good screen capture software which could deploy the captured video in Flash and FLV. And reviews of this porduct seems to uphold the legacy of wondershare.. Thanks for the one more nice giveaway. Wondershare DemoCreator will help me to present my projects in better way. Consider me in for the giveaway. Best Regards :). wow, look like this is good software !!! Very Nice! Count me in too! And Thanks for the opportunity! Thanks for holding the DemoCreator giveaway; and thanks to Wondershare for providing fine software. • More audio parameter controls would be useful. I could use this program for some on-line education and information materials that I have to put together. My daughter is beginning her student teaching and could use this software as well. The pros outweigh the cons on this software. Some of the cons may have been due to the limited amount of time I had to work with DemoCreator. It would be great to have the licensed version. Please enter me in the contest. Please add me to the list of hopefuls for this Wondershare DemoCreator giveaway. After having the chance to try it can only say one thing: This is a screen recorder on steroids. This baby can do it all, and more as well as not challenging a computers resources. 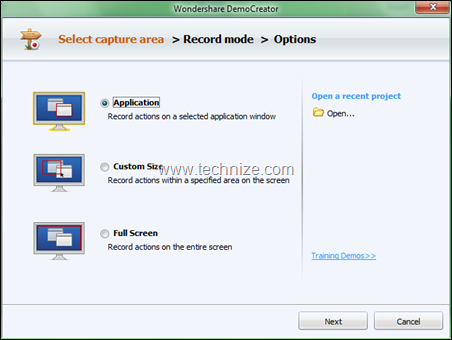 This review tell me easily how to work with Wondershare Democreator. I have a good start. Now I think about publishing my presentations. The editing feature is the best one, I have ever seen before on this kind of software. In my opinion technize.com is very interesting and the Giveaways are great. Thanks so much for flooding giveaways..
My presonal view for regarding your site is very informative very useful for readers.so i dont have nothing to say in my mind but your forum some articles seem intend to crack and knowledge for illegal users so this may be affecting ur forum reputation. ( i means that one article mentioned that how to make geniue window pls go to this site blah blah blah ). This looks alot more useful than CamStudio! With this killer app ill be able to make some kick-arse demos for training. Lets see im lucky enough to win a copy! Can you point out the posts where the illegal stuff is mentioned? I think I have already removed all the illegal links on request. I’m wanting to win Wondershare DemoCreator to be using for my working use. I’m liking your site and also subscribed. I am finding the link from your sites Friendly sites link to HD Doctor Blog very useful and infornative. I have worked on a number of multimedia projects and found snagit very effective. Seeing these images of the product, I am excited to test its capabilities. There is definitely room for more in Snagit. lets see what this has to offer. Technize and Sanix,big thanks for the Wondershare DemoCreator Giveaway.This product is just perfect for taking good screen recording presentations anywhere I want.And yes this site is definitely nice to obtain information on many information,more power to readers.Keep up the good work and good luck. Thanks for this giveaway opportunity. I have been ur subscriber for quite some time now. Coming from Technical field I found ur articles/posts quite interesting. You have been posting very good mix of articles about privacy, security products, social network, netbooks/laptops, non-windows, open-source stuffs and others. Your site is sleek, better designed, with no clutter as to what I notice. It would be great if you could review the Blogrolls and Friendly sites, removing the dead and those which are pointed RED by WOT . Wondershare DemoCreator is another GOOD product from Wondershare team. Those who have addicted to Snagit may list tens of things against it. So for all these ppl let me tell that Wondershare DemoCreator is not a copy of Snagit. I’m telling as I have used both of them. Wondershare DemoCreator is a complete product in its category, and does a lot more than just a screen-capture/recording software. It supports 6 different outputs format for publishing [up to 7 video formats: AVI, MOV, MP4, WMV, MPEG-2, FLV, 3GP) to video host like YouTube ]. These are good enough for a normal/advanced user. Moreover there are 4 different options for quality of a published video. Settings are easy to configure as it doesn’t required me to peek into the help file. The interface is similar to Office 2007. It allows to preview changes in real-time by either starting from first slide or the current slide. This is helpful in quick review of the recording. Moreover we can add callouts, etc to make the recording more lively. Thanks to Sanix and Wondershare!! Question: Was someone able to record the live audio using it? Thanks for the giveaway. If I win I could use it for my part time work which involves screen-casting activities. I’m amazed reading your review on the capabilities of this software. It would be great if you could count me for one license. I have reviewed MANY screen capture programs in recent months, including free, such as CamStudio, and licensed, such as Tanida DemoBuilder and Wondershare DemoCreator. I have narrowed the field to these last two offerings for use at our credit union. In fact, I may buy both DemoBuilder and DemoCreator; however, DemoCreator is half the cost of DemoBuilder, so all things considered, DemoCreator is the more attractive option. The real test, of course, will be to use both trial programs side-by-side for a few weeks, to determine the real winner. I would certainly like to be considered for a DemoCreator license. We are ready to start producing tutorials of our online services, such as Account Alerts (a feature of Online Banking), online Bill Payer, and others. Thanks for the great information and opportunities offered by Technize. thank you for the giveaways..Will check your site often to see other great giveaways you make! Your site is giving a lot superb softwares and of-course plenty of valuable informations,that I could really use. DemoCreator’s screen-recording and capturing looks much better compared to it’s competition. Thanks Sanix and congrats to all other winners.